One of the reasons I’ve strayed from running in the past involves the lack of desire to accomplish new feats. The first time I ran a ten-minute mile, I had no desire to go for a nine-minute mile. As I get more confident in my running, I’ve been asked if I’ve considered upping my distance and signing up for a ten miler or half marathon. I’ve thought about me, maybe if just so I can put a cool “13.1” sticker on the back of my Subaru. 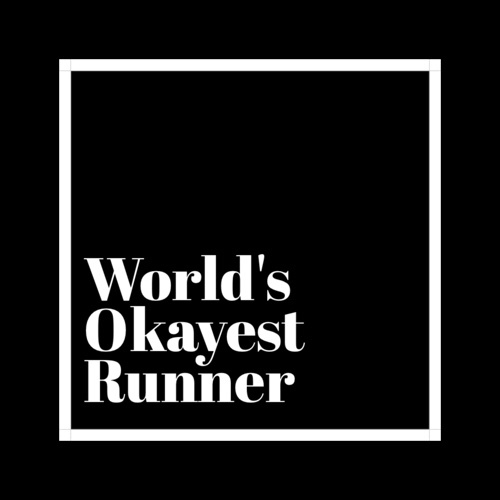 Truth be told, I have more desire to have the bragging rights about running a half than I do about the actual act of running one. October brings three races for me. The first is the Color Run. Liam and I did it the first year it came to Providence. Four years later, he still asks to do another one. I refused to spend the full $44.99 each for us to participate. 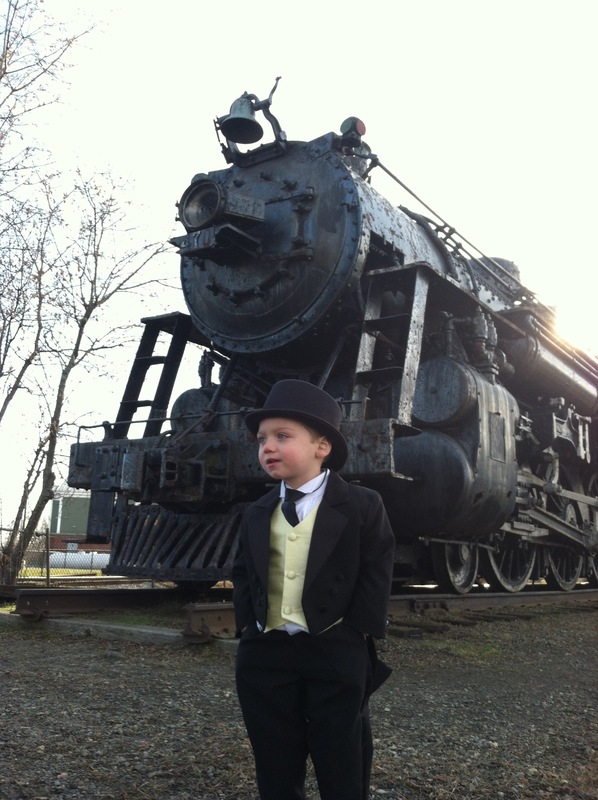 (Seriously, I could take him to Edaville for the day and only spend $54.) When the Color Run offered $19.99 tickets, I signed us up. I remember talking to my friend after completing it for the first time; we made a goal that we would train and be able to run it the following year. We made the goal for the sake of making it, knowing full-well that we would not train for this. Even though Liam and I will walk most of it, I am proud to know that I could run it. I love seeing progress. Also, Mike and Liam have so many common interests (Legos, airplanes, etc). My next race it the Jamestown Bridge Run. This is a four-mile race. I keep saying that I am going to get around to running four miles before the race, but I always stop just after three. Since it is three weeks away, I need to get on this. Since it’s a bridge, the beginning of the race involves running uphill. I’ve been told that there are so many people participating that it is difficult to run around the walkers. I am okay with this. I’ve always been intrigued by this race and am beyond thankful that a few friends and I are doing this one. Since signing up for the race, I’ve driven over the bridge a few times, wondering what possessed me to think this was a good idea. I know I will complete the race, but I’m not sure this one become one I do each year. The Monster Dash is the following weekend. I’m really looking forward to this one. A lot of the BRG folks attend. I’m still deciding whether or not to wear a costume. 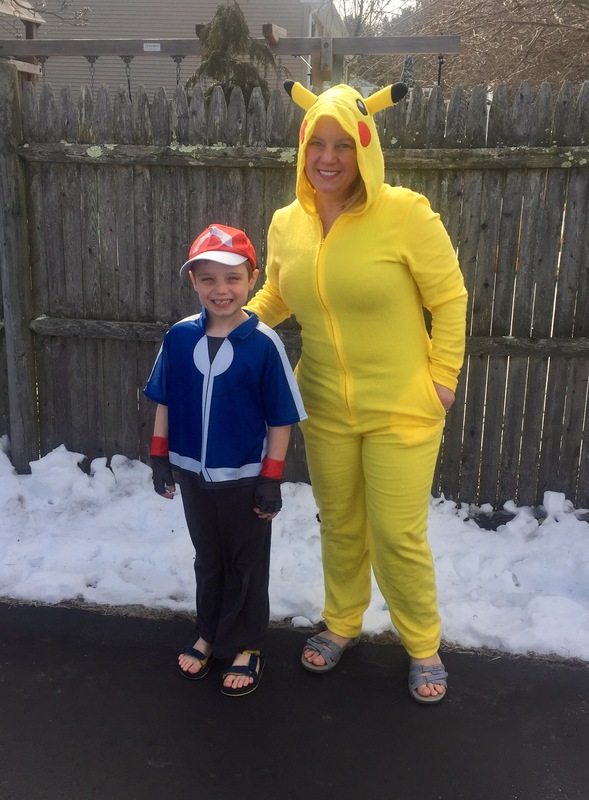 I have my Pickachu costume that I wore for this year’s plunge . I could easily run in this one. Because I am not a fast runner, I wonder how much attention I want to put on myself. I was not planning to run three races next month. I’m glad my schedule and budget allowed it. For now, I am perfectly happy being a 5K runner. I am proud that my training allows me to complete the race non-stop. I’m proud that I was able to complete my first race within my forty minute goal. I’m working on completing them faster and wondering if the upcoming cooler weather will help in these goals. I still challenge myself by trying to run fast and playing with intervals. My runs fit into my schedule and leave me feeling accomplished. The future may bring a desire for longer distances. For now, this will be enough. 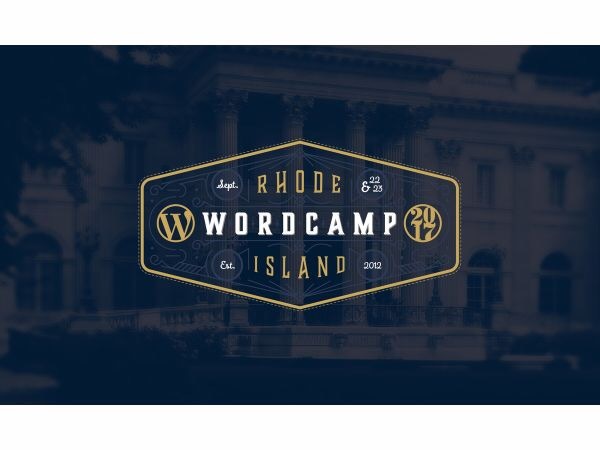 This past weekend, I attended my local WordCamp, a conference geared towards learning more about WordPress. As a beginner, this was so helpful! I learned about Plugins, which I knew nothing about and was too scared to explore for fear of messing up my site. A session about steps for maintaining your site was super helpful! I learned about data analysis, which was fascinating although non-applicable to me and my personal blog. Since starting on the Summit Learning Platform, I have become a huge data junkie! WordCamp’s session on data stories informed me that I don’t know what I don’t know. There are plugins that allow you to see whether readers are viewing your site from a mobile or desktop device. Going further, you can see which mobile device readers are using to access your site, which would prove useful if you are a higher end company looking to attract customers with enough spending cash to afford the iPhone X. The information was fascinating and understandably helpful to people using their sites to generate sales. As months go by, writing has become a priority. Like spending time with Mike and Liam, working out, and reading, writing is something I make sure to include in my schedule. At the beginning of each week, I schedule my workouts; I am now doing the same for writing. Writing forces me to examine the most important things that are taking up space in my mind. Sorting them out helps my anxiety. I’ve written several things that never see the “Publish” button. Just the motion of typing out thoughts is cathartic. I am left wondering how follow bloggers made the decision to share their work. Was it the intention all along? Did they invite a few people here and there along the way? Does knowing friends and family are reading sensor what they write? I have mine set up to share with people I know when I am ready. I’m assuming the universe will let me know when the time is right. 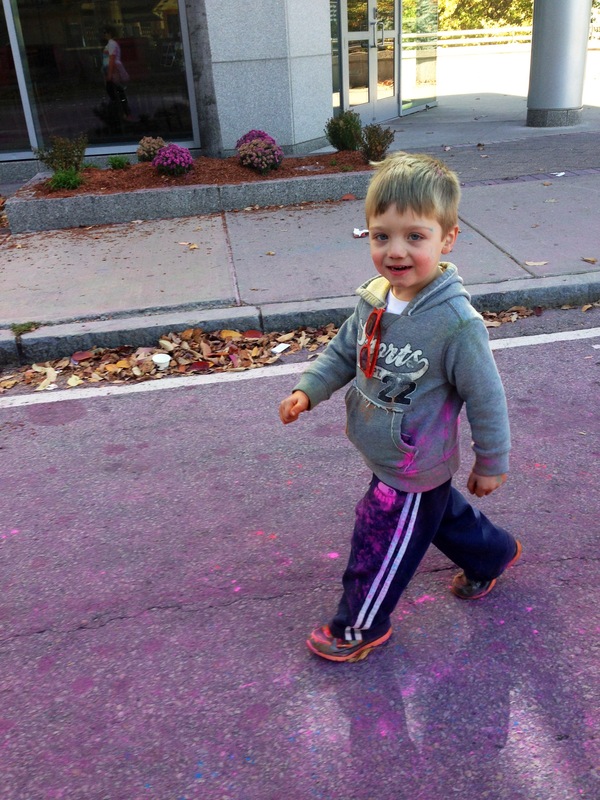 Two years ago, Liam had his birthday party at Laid-Back Fitness, a local gym that offers obstacle training courses. He had such a great time that we later signed him up for “ninja skills” classes. The results are amazing! Liam is a bright boy (I know all mothers say that of their children, but he catches on quickly.) As he entered first grade, the work became more challenging and he struggled with struggling. Ninja skills classes created meaningful perseverance. Liam really didn’t care about learning place value, but he wanted to climb the tall ramp and ring the bell at the ceiling. I’ve watched him spend forty-five minutes trying to cross cannonball alley. There is nothing greater than seeing a beaming proud when he masters something for the first time. Ninja skills classes helped Liam learn how to struggle. When he gets frustrated about something that keeps alluding him, I remind him of all the things he previously thought he couldn’t do and, if he works hard, he will reach his goals. My body strength is funny. Every aspect of my strength is countered by a weakness. I can deadlift 165 pounds but can’t do a pull-up. This amuses me that I can lift my body weight but can’t pull it. While I’ve dreamed of being able to do a pull-up for years, my first goal is to cross the monkey bars. During Bolderdash, I was able to do four of the monkey bars. 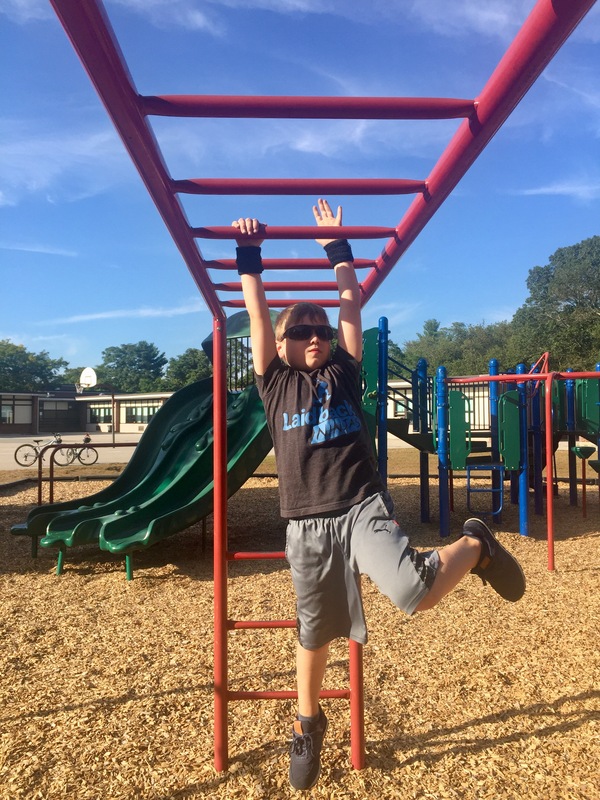 Because I am always trying to help Liam, he is more than happy to “train” me to cross the monkey bars. Yesterday, we went to the local park. He has skills testing next week and wants to practice a few climbing moves. 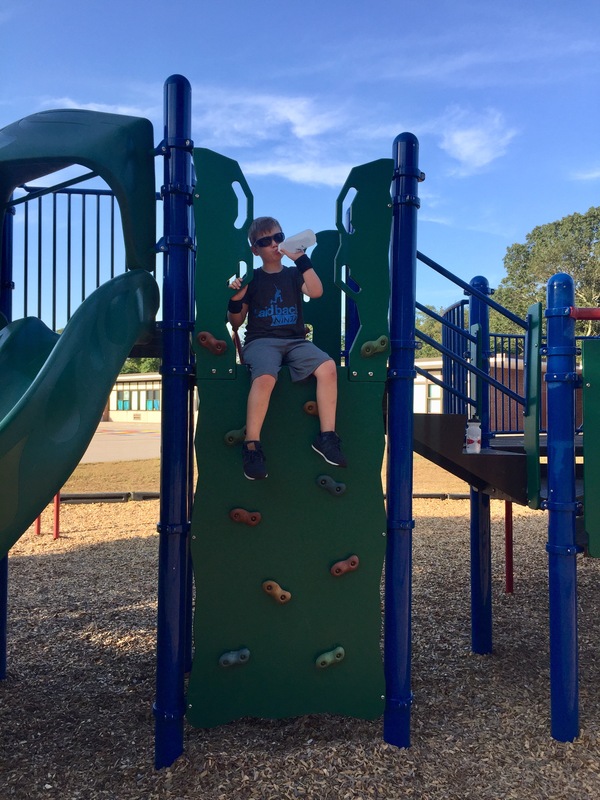 Once we got the playground, it became clear that his biggest goal was to help me cross the monkey bars. He demonstrated how to do it several times, explaining momentum and pacing. He was so proud of himself for being able to teach me something. I loved seeing how much of myself came back out of him. He explained things slowly, chunking information. He asked questions to ensure I understood what he was saying. He modeled monkey bar crossing several times, offering to “meet me int he middle of the bars” so I could follow his lead. When I worry that I am not properly raising him, I need to remember moments like these. He decided to sit at the top of a landing by the slide so he could see what I was doing, cheering me on and reminding me what I needed to do. He cheered me on, gave me support, and told me what I could do to improve. He says he wants to be a teacher when he grows up (or a ninja, pilot, or race car driver). He definitely has the teacher gene in him. This is where he thought he could best see what I’m doing. 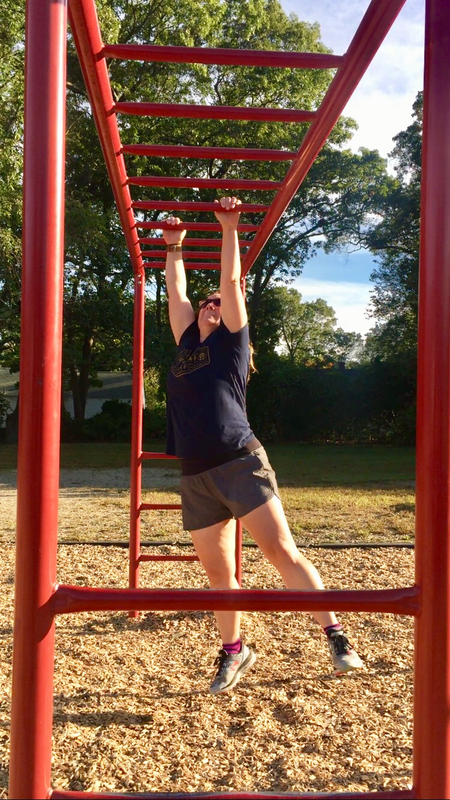 By the end of the “training session,” I was able to cross six monkey bars, two more than I could complete three weeks ago. I’m glad Liam sees me struggling and trying to improve. I think he will be more excited than me when I finally cross those monkey bars! I’ve enjoyed writing and found a good routine to make time for my practice. My latest concern involves actually finding interesting subjects. Poking around on other blogs, someone suggested different prompts for when you’re not sure what you’d like to write about. The idea of Tea Break Tuesday is to share what you’ve been up to currently. Liam is such a big part of my life, it makes sense to write about him. He is loving second grade! He is even saying that he’s like to a second-grade teacher when he grows up! I am embarrassed to admit that I have not formally met his teacher because Mike represented us this year at open house. Mike came home announcing, “You should’ve gone. She’s just like you- another Google fanatic.” I love what she has set up in terms of technology! As someone whose own teaching revolves around technology, I am tickled that she has Liam on Google Classroom in second grade. Liam practices his spelling words on an app called Spelling City. It not only lets him know when he is making progress, it lets us know how long and how many tries it took for him to master a skill. She also sends assignments via SumDog, another program that I had him start doing last year. I love seeing him become a big kid. His biggest struggle is the balance between wanting to be big while holding onto things he loved when he was little. He stressed himself a few times about his favorite stuffed bunny, Miles. When he was younger, Miles went with us everywhere. We even bought a new Miles because Old Miles was getting worn out. After forgetting him at school and fearing that Liam would be unable to sleep, we purchased School Miles. Liam’s ability to do just about anything while holding Miles is awe inspiring. Miles was an extension of Liam. 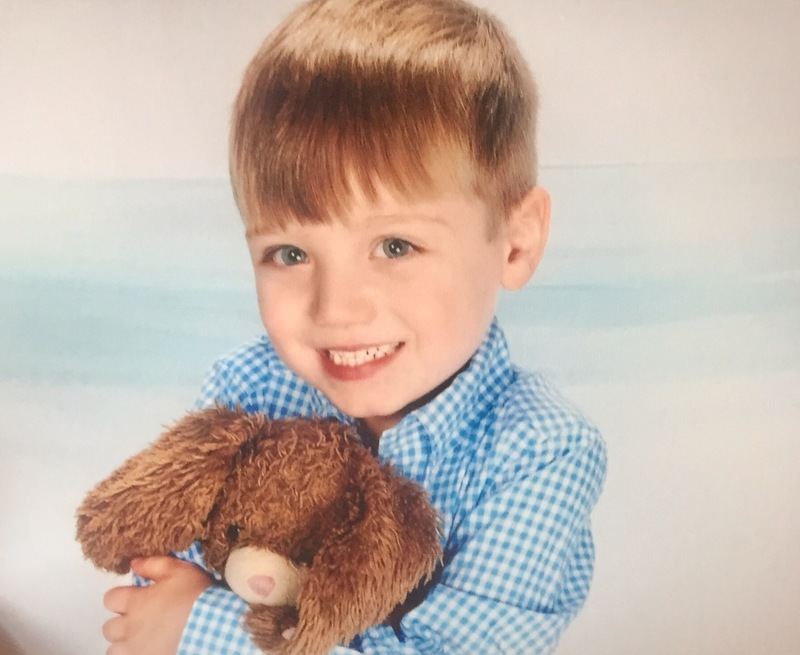 He still loves his bunny and sleeps with it each night, but worried that he was too old for his beloved stuffed animal, randomly bursting into tears when he thought about it too much. It is a difficult, unexpected balance for him. He wants to be a “big kid” and play Pokemon and Minecraft. While he doesn’t play with his Thomas and Paw Patrol toys, he isn’t quite ready to give them up just yet. Liam’s teacher invited stuffed friends to join them on Fridays to read. 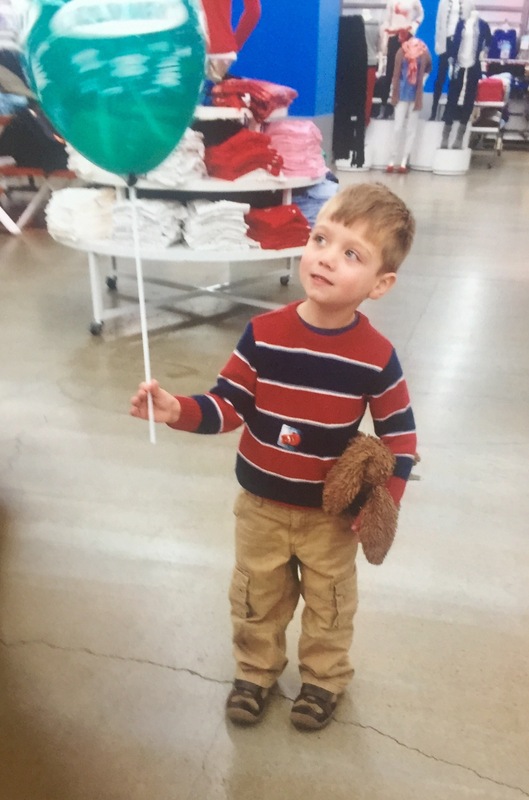 Liam was excited to bring Roscoe, his stuffed dog. I couldn’t wait to ask him about the first Friday reading with friends. Most of his classmates brought stuffed animals; the ones who didn’t were quite upset for forgetting. 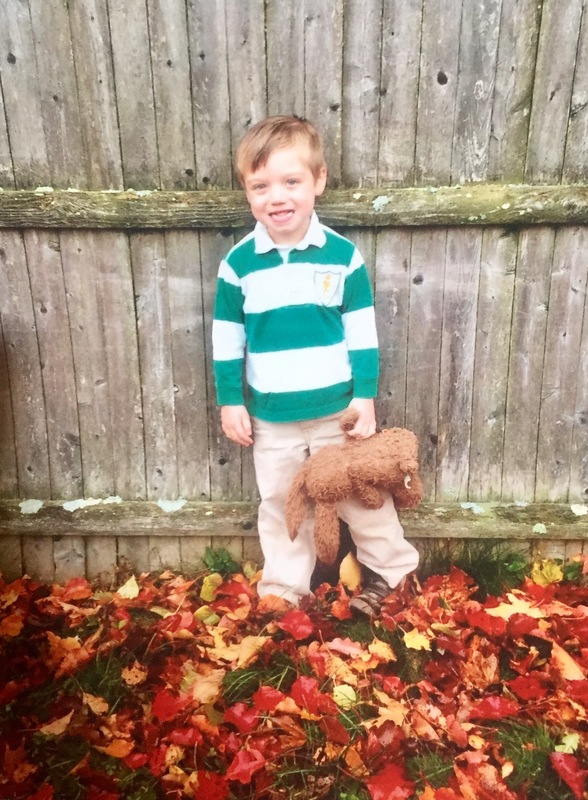 The biggest takeaway was making Liam notice that most of his classmates also had stuffed pets. Therefore, it was more than okay for him to have one. Liam learned that he is not too old to have a lovie. 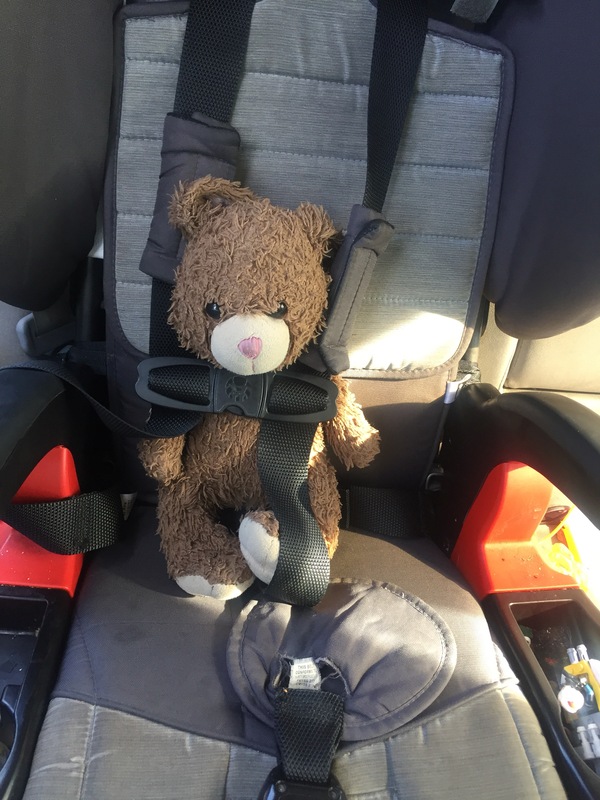 For the first time in about a year, he took Miles with him on the ride to school today, buckling him in when he left the car. Liam finds little ways to let me know that he is growing up each day. This was the first day he took his friends’ words over his Mama’s. I’d be naive to think it will be the last time. The idea of yoga always fascinated me. I loved the yogi vibe, their lithe bodies, and their simplicity. I first purchased a Pilates video and didn’t mind completing it, but didn’t feel passionate of accomplished in regards to taking them. Eventually, I felt comfortable enough to go to a Pilates class at my gym, surprised and impressed that I was able to keep up with the rest of the class. After sharing with a friend that I had always wanted to try yoga, we decided to attend one at our gym together. 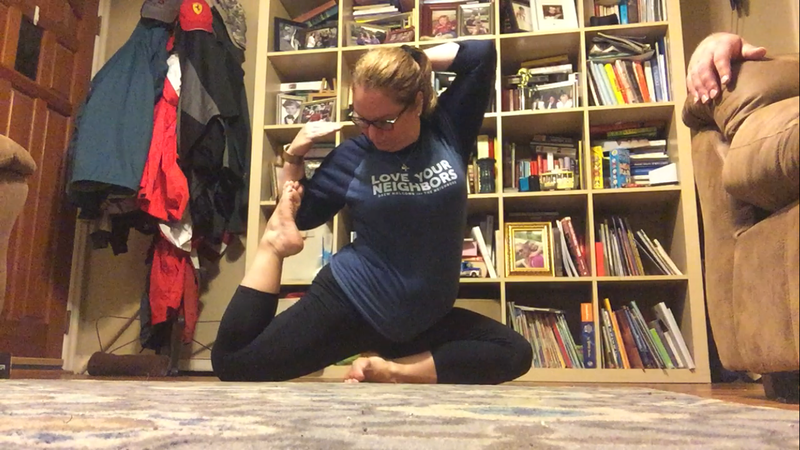 The only thing I remember about that class is that my normally baggy gym clothes were not conducive to yoga; I spent most of the class trying to keep my oversized Eagles T-shirt from falling up during downward dog. I couldn’t get my mind to shut down during Shavasana and laid there waiting to feel something zen. I am competitive by nature. However, my competitiveness is subtle. You won’t know we are competing, but I assure you that we are in my mind! I am not tiny. My figure is average, but not what I would consider athletic. Years of retail, waitressing, and teaching gave me muscular legs, but that’s about it. In spite of my figure, I am really good at yoga. It is rewarding that I am never the smallest person in the class, but I can keep up and sometimes exceed other in the class. Once, I took a class filled with women wearing Lululemon sports bras and leggings. I was totally overwhelmed by them (my issue, not theirs). While fully aware that this goes against everything yoga teaches, it made me feel better to discover that I was just as flexible and talented in my practice. Most weeks, I am able to attend two yoga classes: a higher and a lower level class. Tuesday’s class is challenging. I love being sweaty and winded when I leave. Saturday morning’s class is low-key and relaxed. We complain if we are made to stand up. During both classes, we laugh, get sidetracked, and engage in inappropriate conversation. Learning the importance of breathing has greatly helped my weightlifting. Yoga reminds me to take time for myself and that doing so isn’t selfish. It makes me a better wife, mother, friend, and teacher. Yoga reminds me that I need to recharge and challenge my mind as well as my body. Yoga reminds me that I am a work in progress and that habits must be maintained to stay sharp. I was so nieve when I decided to become a mother. While I knew some parts of our lives would drastically change (no more weeknight concerts and Red Sox games), I truly believed that my friends would not change. No matter how many times Mike tried to tell me that we would be left behind, I wanted to believe that our child would be a welcome addition to my childless social circle. When some of my closest friends did not come to meet Liam until over two weeks after we were home with him, my defenses turned up. In hindsight, I can honestly say that the first six months after Liam was born were the hardest I’ve ever experienced. When Liam was a month old, my mom got really sick. We flew down to Florida to see her, knowing it was probably the last time we would see her. Three weeks later, we drove to Maine for Mike’s grandmother’s funeral. We returned home to find two feet of water in our basement due to the great 2010 floods. Two months later, my mom passed away. While all of this was happening, I was trying to keep a tiny human alive. A tiny, crying, colicky, chronically ear infectioned human. During all of this turmoil, I was home with Liam, lucky enough to have seven months home with him before returning to work. The days were long and lonely. Facebook didn’t help. It reminded me of all the things my friends were doing without me, things I wasn’t included in or invited to. They joined Weight Watchers together, walked local parks, went blueberry picking, out to dinner, and attended concerts. The only reason I knew about these events was Facebook. After months of crying to Mike every time I checked social media, I deleted Facebook. It was freeing, but also further isolating. Months went by. Liam was much easier and mobile. I joined a mom’s group, hoping to get Liam socialized. As I walked into the playgroup building for the first time, I panicked, realizing I also needed to be social. We continued to attend events. Sometimes I was side-eyed for giving Liam non-organic snacks. Other times, I was the one doing the side-eying. I joked with Mike that making mom friends was like dating all over again. Eventually, I made amazing mom friends! They are the most important people I know. We vent when needed and help each other out. We text silly things and keep group chats going on messenger. (Who else really understands your excitement about going to the bathroom or Target by yourself?) We plan time to get together a week in advance rather than on the fly, knowing time is precious. We grill and hang out at each other’s house, hosting barbeques that start at 4:30 instead of 7:30. For someone who spent the first two years of Liam’s life feeling incredibly lonely, mom friends are priceless. I have my yoga crew, my local mom friends, a few older friends who later had kids. My life has changed much more than just passing on weeknight events. We consider sleeping in sleeping past 7:30. We’re proud of ourselves if we can stay up until 10 on a Friday night, remembering when we would just be going out at 10 on a Friday night. As I think about the people I assumed would be a part of my life now, I can say I am glad I was ditched. While it was excruciating at the time, it forced me to venture out and make new friends. I wouldn’t trade my friends for anything. I don’t think there is any animosity among old friends. Sometimes, we go years without seeing each other and we try to pretend we’re friends when we run into each other. Too much time has gone by to pretend that we will ever again be great friends. I’m thankful for friends who make me think, who challenge me in yoga and running, and who understand the importance of each other. For the first time in over a week, I made it out for a run on the Boulevard. Last week, I was still recovering from Boldrdash and only made it two miles. Every step strained my hamstrings. But I was there and committed to two miles. Because my Mindfulness class talks a lot about perspective and active seeing, I intentionally chose to find twice as many positives as negatives. The weather was perfect! It wasn’t too warm or cool. It was cloudy enough that I didn’t need my sunglasses. It is a beautiful time of year! We’re at the sweet spot of New England between summer and fall. Flowers are still blooming, but the leaves are starting to change color. I met my preset goal. I wanted to pace in the 12’s. 12:59 pace is in the 12’s! I felt so much better after! Yesterday’s session gave me much-needed time to think and clear my head. Three miles no longer feels like a daunting task. I can do it pretty easily. There were a few times that my legs tired, but I easily convinced myself that I could keep going. I am able to run. This may seem overly simple, but too many people are physically unable to run or walk for various reasons. I am thankful that my body is healthy enough to allow me to run and workout. Allergies. This is a big one. Most of my adult life consists of a vicious cycle of me taking allergy meds until they work, assuming I no longer need them and not taking them, then suffering a few days later. My eyes may have loved the summer/fall beauty, but my sinuses were not impressed. I’m still not as fast as I’d like to be. I made a lot of progress early on. I’m not sure why I’m not getting any faster. I think it may be a mental block; I slow down too quickly. I need to find an app to track intervals that is also Spotify friendly. I still can’t make it much further than three miles. 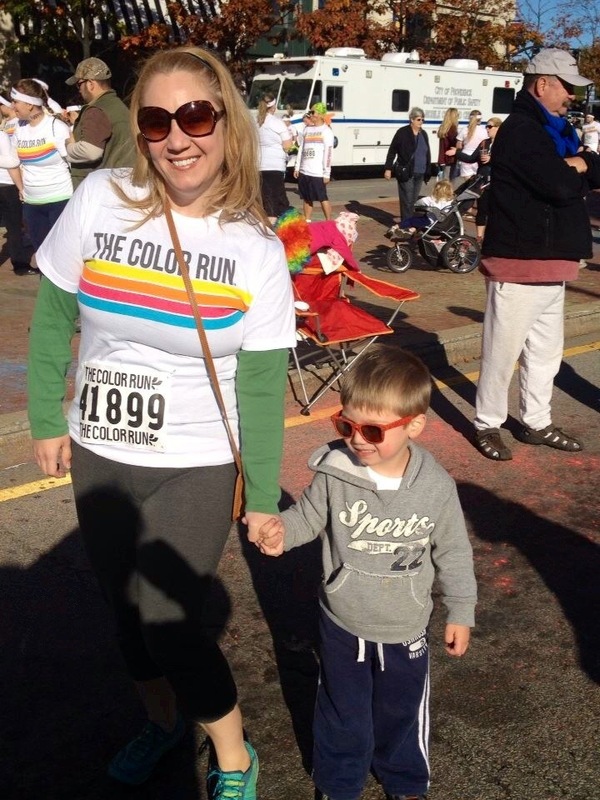 When I start BRG, the goal was to run a 5K. I’ve done that many times now. At the beginning of each run, I make myself promise to get over the three-mile hump, then stop when I reach that distance. I have a four-mile race coming up; I want to run that distance a few times before doing it in a crowd. This semester, I have the fortune to teach an elective about mindfulness. The skills are so important; I am struggling with these ideas in my forties. During the first month, we are learning about how the brain reacts to stress and researching the idea that we can retrain our brain to adapt differently to stress and anxiety triggers. In addition to ideas and theory, I’m providing concrete things students can do to improve their mindset. We are exploring keystone habits. Keystone habits are changes that spill over into other aspects of your life. For example, when I work out, I tend to eat healthier. When I’m not exercising, my healthy eating habits go away as well. My students and I decided to start with two simple keystone habits: drinking a glass of water as soon as we wake up and making our bed each morning. Research shows that people who make their beds each morning are happier than people who don’t. It takes less than two minutes and provides a sense of completion before leaving the house. I already make my bed, but have begun drinking a cold glass of water each morning. I’m interested to see how it helps. I’ve mentioned my excitement over being back into the school routine a few times. I love being busy! I thrive on it! In all of my bustle, I always give thanks to my husband. It’s not that I need his permission to be busy, but it definitely changes our routine at home. I also try to make sure that everything that needs to be done that around the house is completed. On Mondays, Liam and I got to the gym for his Ninja Skills class and my Strength Training class. On Tuesday evenings and Saturday mornings, I go to yoga. My try to run twice a week (this week, I will only get out once). Sometimes I feel guilty that I am out a few times a week and away from my family. Mike has never given me an ounce of grief about it. Last semester, I joined BRG and took a class on change management at Bryant University. Some weeks, I was out four nights a week. Mike didn’t flinch, only promised me that we would get through it. There is no way I could invest this time without his help and support. I know I am fortunate. What does Mike get in return for being solo a few hours a week? Since I make sure as much as I can before we switch Liam duty in the evening, he doesn’t have to do a lot around the house. More importantly, he gets a wife whose head is mentally clear. I am able to run out thoughts and frustrations. I am able to challenge myself through yoga and laugh with the best group of friends a girl could wish for. My son gets to see Mama being healthy and taking care of herself; this transfers onto him. He wants to eat healthily and drink more water. Liam watches me run and complete races and set goals for myself. He does the same, wanting to cross cannonball alley at Ninja Class and feeling the exhilaration of meeting a goal! I love that being active is something we do together. I hope that this leads to a lifetime of health for Liam! My yoga squad consists of some of the most important people in my life. In adulthood, there aren’t many friends we get to see twice a week. We know the intricacies of each other’s lives, share successes, and vent when we need to. We tease each other yet push ourselves to take risks and become better versions of ourselves. We confess secrets and fears and show our vulnerabilities to each other. These women know me better than most other people in my life. Two years ago, our instructor moved the studio to a new location, one without a mirror. The first few sessions were difficult. I relied on the mirror to make sure I was aligned, that I was properly holding poses, and to bask in my badassness when I mastered a pose that previously eluded me. I needed those mirrors and not having them was a new challenge. Weeks and months went by. I learned to judge my form by how I felt, with guidance from Nora as needed. Surprisingly, I found mastering poses easier without the mirror. Previously, I would get so close to a pose, check myself out in the mirror, break my drishti, and tumble. 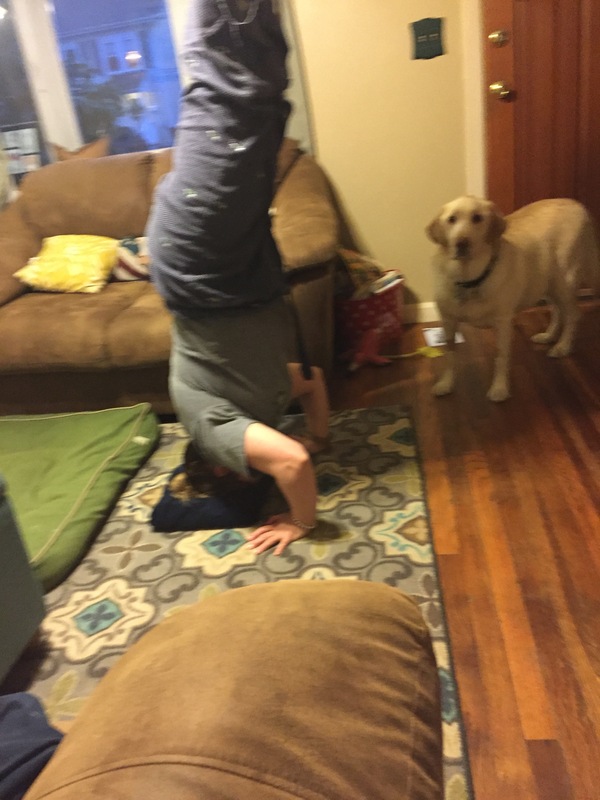 Without mirrors, I was finally able to nail handstand. I can hold crow for a few seconds and pull my leg higher in dancer. I focus on my practice rather than worrying about how I think I look. Last night, I tried a stability class at another studio. At the front of the room was a full-length mirror. I couldn’t stop watching. While there were a few times that I was genuinely pleased with seeing my muscle tone and admiring what I was able to do, most of my glances resulted in me grimacing or adjusting my flowy top to hide a tummy roll. Early in my practice, I relied on the mirror to tell me on I was on the right track. As my confidence grew, I relied on knowledge and intuition. Practicing yoga without a mirror has taught me to trust my instinct and knowledge to get myself where I need to be. 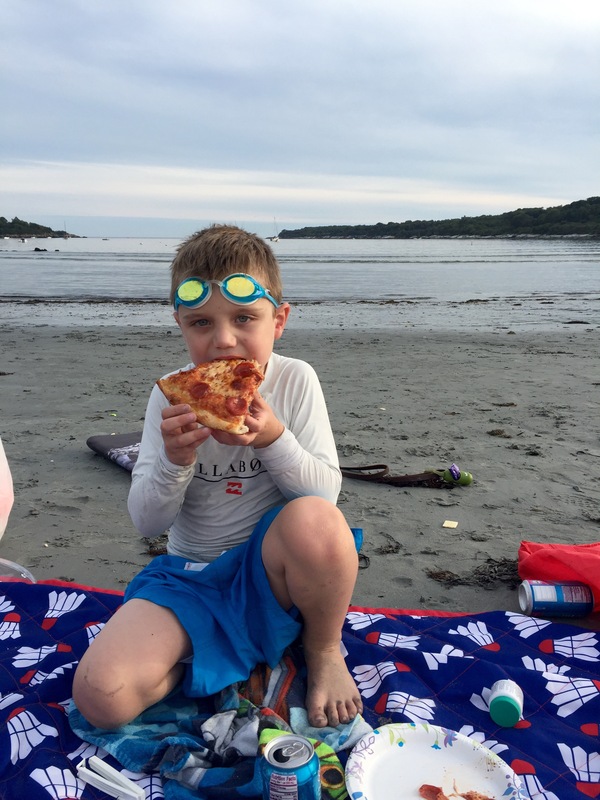 Mid August, Liam and I usually fall into a panic about the end of summer. We need to do all the summer things and make each precious day count. Once we get into the back to school routine, I am reminded how much I have always loved fall. I love the beginning of the school year. 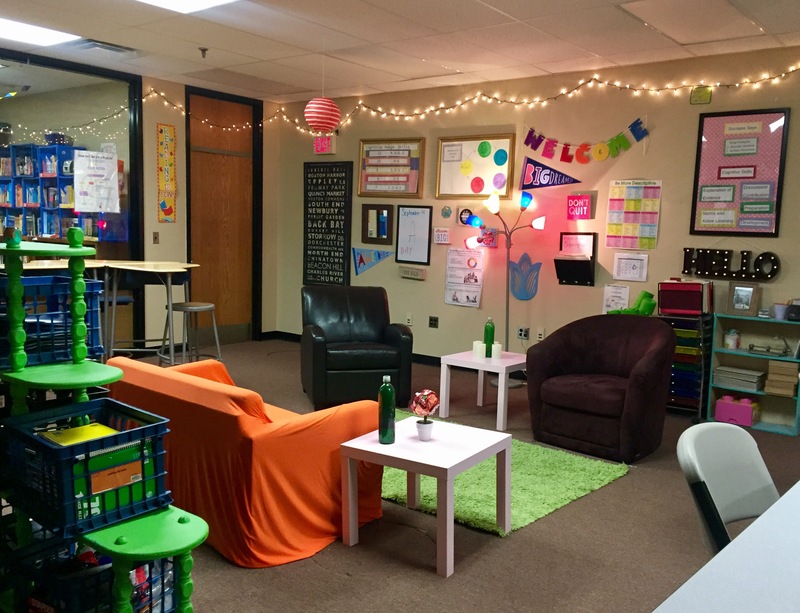 I’ve always changed up my classroom a bit and created new projects for my students. This year, I’ve added a couch and two chairs, a big framed board explaining projects and graded cognitive skills, and a light up “Hello” sign. My students love their first Socratic Seminar Project. As much as I love wearing comfy clothes each day, I love dressing up and needing to do my hair and makeup. I am also blessed with amazing colleagues who add to the excitement of transitioning back to school. I’m fortunate that I never dread starting a new school year. Liam loves second grade, claiming it far superior to first grade. His teacher seems lovely and fosters his love of learning. I love seeing him grow and hearing him talk about all the great things he did each day. This past weekend, Timehop provided a huge surprise. I can’t believe he is so grown up! I love sweater weather! I love feeling a chill in the air and sleeping with a window open. It’s also nice to be able to wear makeup without it sweating off and having cool enough temperatures to wear your hair down. It’s nice to have fires in the backyard and sit around with the people I love most. Running is definitely easier in the fall. It is easier to breathe, and I don’t have sweat dripping in my eyes. This week, I loved watching the colors begin to change as a ran the Boulevard. The transition to back to school is as seamless as turning on a switch for us. I am amazed at how well we all go back into school mode. 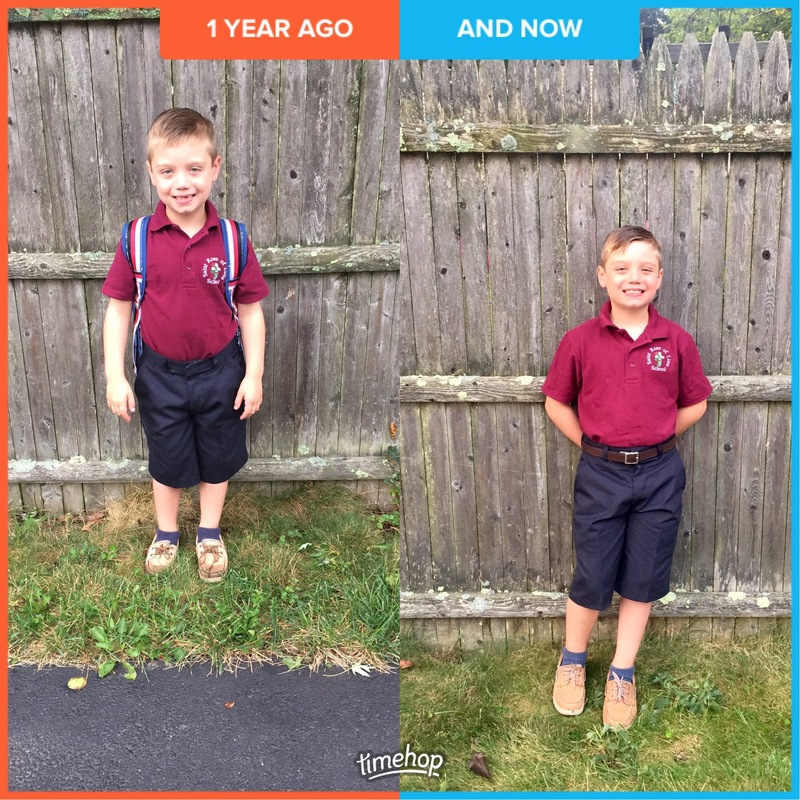 Over the summer, we did a great job of keeping Liam on his school sleep schedule, eliminating one of the hardest transitions. Come September, we go back to meal planning on Sundays, afternoon errands, remembering forms and projects, planning and correcting (me), homework, evening walks, and filling the weekends with fall activities. I love knowing that we have full, productive days. As much as I love cooler temperatures, nothing screams fall in New England quite like a random fall day with temperatures in the 80’s. My favorite things to do on these warm days is to head to the beach, even if we go after school. I pack our beach gear in the car the night before. Mike, who gets out of work after me, picks up a pizza and meets us there. Being able to enjoy the beach in September (and sometimes October) is one of the greatest treats. While being busy, I think we do a better job of appreciating each other as a family. We make a point of eating dinner together and talking about our day. Each evening, we take a walk around the neighborhood. If we miss more than a day or two, Liam reminds us that we are overdue. Mike and I carve time for ourselves after Liam goes to bed, even if we just chit chat or watch Big Bang Theory reruns. We have at home date nights on Saturdays, sitting outside or watching a movie. Because we are so busy, time becomes a gift we give each other. I love weekend adventures, trying to get as many chores as possible done during the week to gain more weekend time together. The time together seems even more precious. Years of working retail killed any excitement about Christmas I had as a child. Obviously, Liam brought a lot of it back, but I have never been a huge Christmas person. I do the bare minimum when it comes to decorating. I make sure Liam has a great holiday, but I do not play Christmas music or watch holiday movies. Halloween is my favorite! I love the silliness or decorating and dressing up. There is something fun about the idea of dressing up and being silly. Liam and I make a point of buying a few new Halloween decorations each year. We start talking about his costume in the spring. 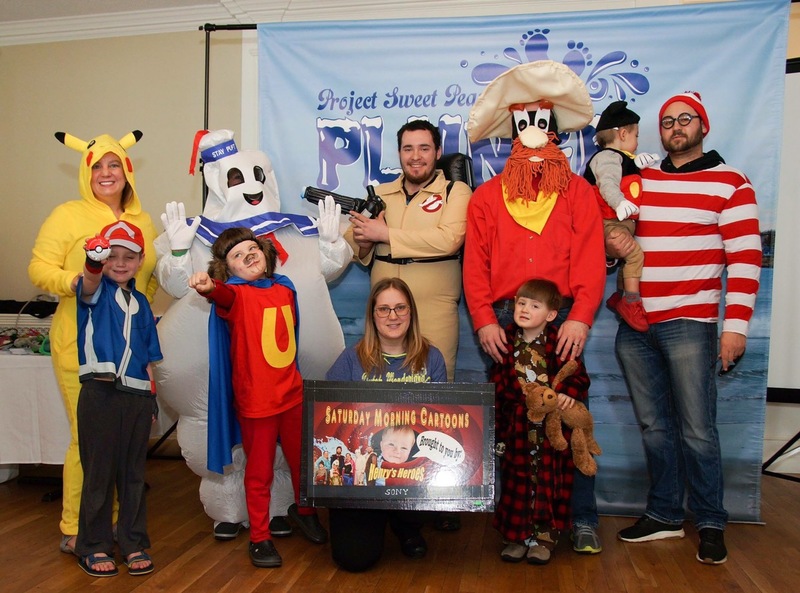 Halloween gives us all a chance to relive our childhood, eat candy, and have fun! We make great plans and spend way more money and time on his costumes than I can to confess. 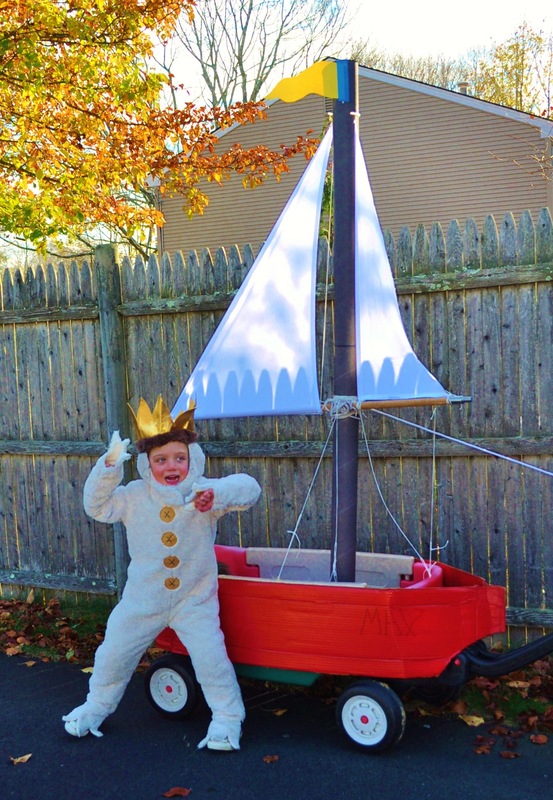 We’ve made props to accompany his costumes, my favorite was when we turned his wagon into a boat when he dressed as Max from Where the Wild Things Are. Each Halloween, we have friends join us trick or treating through the neighborhood. We stop by friends’ houses and see the kids in the neighborhood. Halloween is one of my favorite things about fall.